Link Building plays an essential role in search engine position and ranking of keywords and that is the reason why Link building has a high-flying position in search engine optimization of any website. Link building not only helps in improving rankings on search engines but also helps in getting besieged traffic and boost sales. A good link building strategy is must and sure before we start link building campaign. Few Good Links can do much better search Engine positioning when compare to huge links which are not worth. Links make your website get indexed by search engines so they begin ranking your pages for targeted keywords. It is simple to understand that MORE THE VISIBILTY………. MORE THE BUSINESS! Links are used by search engines to determine how relevant your webpage is to search terms. By building links from relevant and quality websites, you ensure that your web page get indexed and ranked by search engine accordingly. When another website links to your webpage, this will be used by search engines to vote for your website. Quad SoftTech provides all types of link building services such as One Way Link Building, Reciprocal Link Building, and Three Way Link Building. 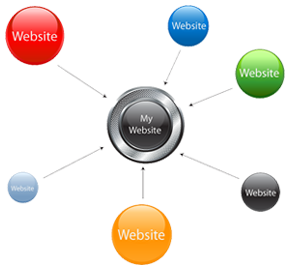 One Way Link Building: As the name suggests it is a Link to your site from another site is called One Way Links. One way links are a superior link popularity strategy. Reciprocal Link Building: A reciprocal link is a mutual link between two objects, commonly between two websites in order to ensure mutual to and fro traffic. Three Way Link Building: In this three way link building take the link from others web site and in return you provide a back links from one of your other website.